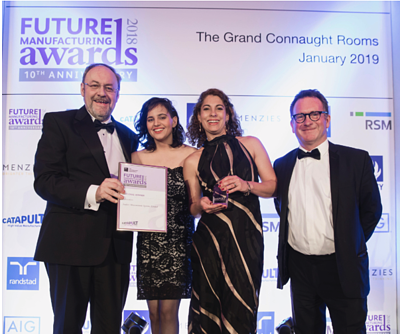 Surface Measurement Systems Limited has won the National Innovation Award from the recent EEF Future Manufacturing Awards 2018 held in London on 30th January 2019. The Innovation Award acknowledged Surface Measurement Systems development of new scientific instruments for materials characterisation, including specifically the Dynamic Vapor Sorption instrumentation and Speed of Sound technology. These instruments are helping thousands of laboratories from pharmaceutical, food, health to aerospace, energy and environment industries to revolutionise and create a better world. Prof. Daryl Williams, Managing Director, with Leanne Dal Santo (Head of Finance and Marketing) and Sumaya Rehman (Apprentice Engineer) received the award from EEF Partner HVM CATAPULT representative Chris White. SMS would like to thank EEF Manufacturing and HVM CATAPULT. 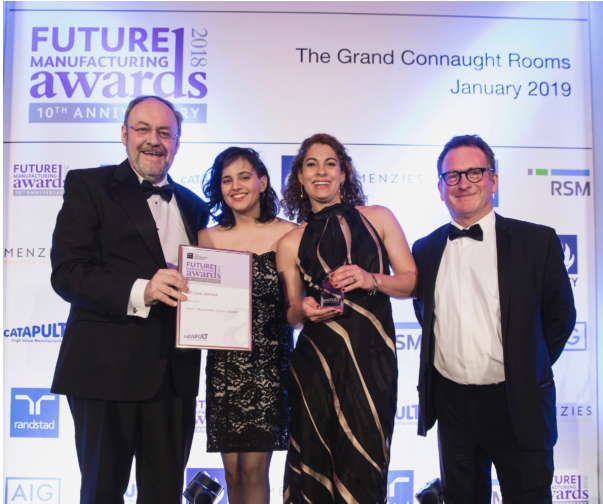 EEF Future Manufacturing Awards put businesses and individuals on spotlight to highlight its contribution to the manufacturing and engineering industry. To see other winners, please visit EEF Manufacturing website. We recently spoke with Sumaya over on our GetMyFirstJob.co.uk Blog, an Apprentice Production Technician who does her apprenticeship with SEMTA at Surface Measurement Systems. Find out what she had to say about her apprenticeship here. Sumaya started searching around March of 2018 and started at SMS six months later, through the use GetMyFirstJob whilst searching for open apprenticeship engineering vacancies. Sumaya stated 'It was pretty simple to use, and all laid out clearly'.